BBQ Frenzy is one of the slots in the Kitchen Drama series, released by Nolimit City and inspired by someone’s BBQ session. Kitchen Drama: BBQ Frenzy is a cooking themed game, one of several which you will find at casinos that are coming from Nolimit City. They actually have a second game in the same series, but one that is inspired by Sushi. The graphics revolve around the image of a grill, with the symbols on it being foods or coals. For the foods, you will find steaks, corn, mushrooms, red peppers, bell peppers and others similar foods. On the other hand, there will also be images of coals that have different shapes. Everything that appears as a symbol is a character, even the coals, so they have eyes and mouths. It’s not a good look for a piece of red meat, but it helps make the game funny. Various sauces and tools are spread around, in the vicinity of the reels turned into a grill. This isn’t the best-looking game from Nolimit City, but the humor angle seems to have been the main target anyway. Anyone playing BBQ Frenzy will find that it has plenty to offer, such as the Chili Wild, the Sheriff Badge Wild, the Gunsmoke feature with its Fiery Chili Spirit Spins, the Wild BBQ Spins and the Wild BBQ Bounty. Expect to play a slot with 5 reels/20 lines, capable of paying $1,000 in its best combinations. The range of your wagers will be $0.20 to $100, in which case you can expect for individual lines to receive as much as $5 each one. One expected feature in this game is the wild symbol, and among the several options available to you, the one with the Red Chili is first on the list. It’s a regular wild, usable in combination with any symbol. The Sheriff Badge Wild is another, a substitute that is also a trigger for a Gunsmoke feature, and then for a Fiery Chili Spirit Spin. This will pick a symbol from the reels, to turn it into a wild. Sheriff Wilds appear during Wild BBQ Spins and they walk from the right to the left side, until it leaves the reels. Wild BBQ Bounty is activated at random, a bonus game that will pick one of three ingredients and then will give you access to the Wild BBQ Spins. There are multiple interesting features in this game, but the action gets a bit confusing. Other than that, it could be a nice way to reminisce about all the great grilling you can do during the summer. 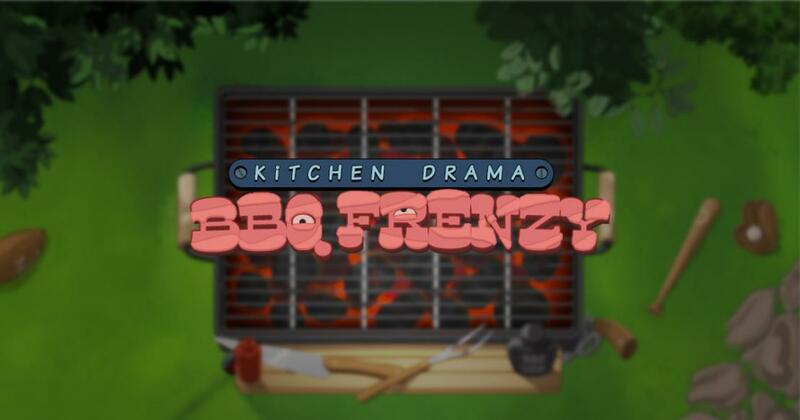 Try of out a demo version of Kitchen Drama: BBQ Frenzy.